"All I need is a damn knife!" Back in 1995 Alanis Morissette released a little album called Jagged Little Pill. This album launched Alanis (formerly of You Can’t Do That on Television and Dave Coulier popped my cherry fame) into international superstardom. The album spawned 5 hit singles, the first being You Oughta Know (supposedly in reference to the aforementioned Dave Coulier), but the one that gets my goat the most is Ironic. 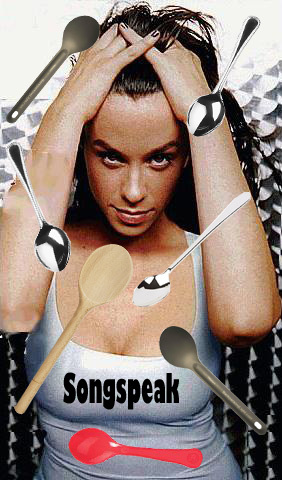 Now, maybe Alanis really just doesn’t understand the meaning of the word. Maybe she’s legally retarded (I mean, she is Canadian, after all). But nothing in the entire song actually constitutes actual irony. Rain on your wedding day? Puh-leeeeeze. Matt and I have had many debates on what constitutes actual irony. For instance, Matt would tell me about how he was writing on a post-it or something, and then the show he was watching would feature a tour through a post-it making factory, and then call it ironic. I’d explain that that’s just a coincidence, not irony, and we’d have to figure out what irony actually meant. This has been going on for years. Collegehumor.com even modified the lines from Alanis’ song to make them actually ironic. I like their examples better, because, well, it really is ironic. Don’t you think? Perhaps Alanis doesn’t think enough of her fans or the general public to believe we would know what irony is. Perhaps she doesn’t know herself. Or perhaps it was done on purpose, and the actual irony is in the fact that a song called Ironic contains no real examples of irony. That would truly be genius, but I’m not willing to give her the benefit of the doubt on that one. I’m gonna have to go with the second option here. Maybe all that green slime affected her brain. Next Post slotMusic skeptic: do we really need a new format?